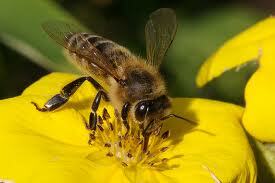 Bees are reliant on pollen as a protein source and on flowers nectar or oils as an energy source. Adult females collect pollen primarily to feed their larvae. The pollen they inevitably lose in going from flower to flowers is important to plants because some pollen lands on the pistils (productive structure) of other flowers of the same species, resulting in cross pollination. Bee’s are the most significant pollinating insects, and their interdependence with plants makes them an excellent example of the type of symbiosis known as mutualism, an association between unlike organisms that is beneficial to both parties. Most bees have specialized branched or feathery body hairs that help in the collection of pollen. Female bees, like many other hymenopterans, have a defense sting. Some bees produce honey from flower nectar. Honey bees and stingless bees commonly hoard quantities of honey a characteristic that is exploited by a beekeeper who harvests the honey for human consumption. There are about 20,000 species of bees worldwide. Some species may not yet to be discovered, and many are either not named or have not been well studied. Bees are found throughout the world except at the highest altitudes. The greatest diversity of the bee species are found in warm climates, especially in the Southwest and Mexico. Getting rid of these pests can sometimes be fearful, especially if you are allergic. A large nest may mean an attack and stings on you or other people in the area. Hiring a Minnesota Professional Pest Control can mean safe and efficient handling of the wasps and bees. Your Minnesota pest control is trained in managing these stinging pests and can remove them from your home or business quickly using our less toxic organic product line. We also do treatments that will not harm other people, or the environment.